189619_01 The O''Brien Real Estate Team from the Pakenham office with the Ireland family. 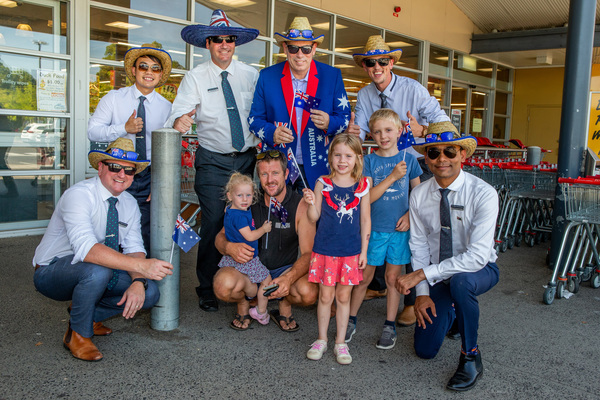 Sweltering heat was not enough to stifle the patriotic spirit of Pakenham’s O’Brien Real Estate in the lead up to Australia Day. The team took to the streets of Lakeside, Heritage Springs and Arena – among others – to distribute 1000 pint-sized Australia flags for free. Their efforts to spread the Aussie cheer were lauded by the community. Brendan Langley and Amanda Owen even hand-delivered an additional 1000 flags to letterboxes in Worthington Estate and Grandvue Estate early on Saturday morning. “It’s something we plan on doing every year, because it’s enjoyable to give back to the community,” Mr Langley said. “There were so many kids who woke up and were so excited. “When we stopped by the shopping centres, the whole team came out and it was fantastic. Children stopped by as the team handed out the props, ecstatic with their new flags.